This post is sponsored by Alexia Foods. 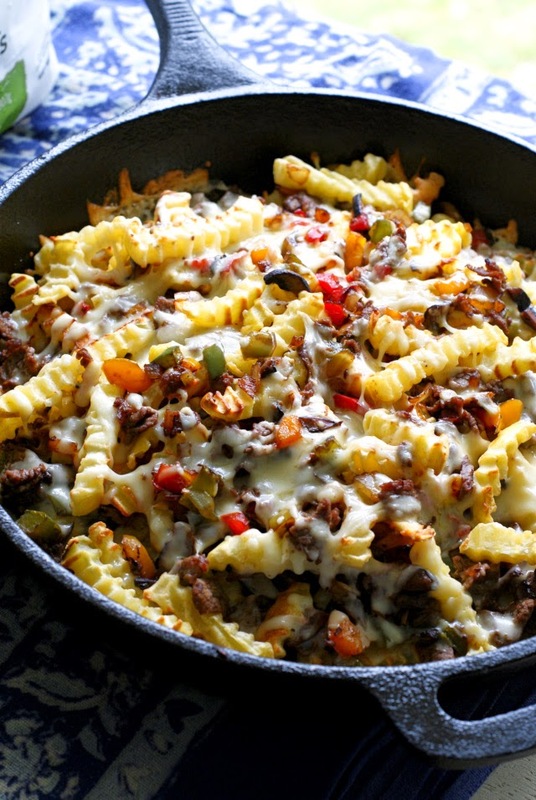 Loaded Philly Cheesesteak Skillet Fries are made with all-natural golden french fries topped with the classic ingredients of a Philly cheesesteak sandwich. One of my very favorite things to eat in the whole wide world is a Philly cheesesteak sandwich with some fries on the side. I could eat that meal all day every day and I'd never get tired of it. Never ever. Cheesesteak sandwiches were in the regular meal rotation when I was a kid, and now I make them for my family, too. Over the years, I've honed and perfected my method of cooking them. I use thinly sliced steak, usually sirloin, and top my sandwiches with lots of veggies and cheese. Lots of folks say cheez whiz is the only way to go for a Philly, but I prefer white American for its stellar melty goodness. I decided to make a meal that is a mash-up of my favorite cheesesteak sandwich and fries. To save time, which is always a plus on a busy weeknight, I used Alexia Smart Classics Roasted Crinkle Cut Fries with Sea Salt as opposed to hand cutting fries from scratch. They are the perfect vessel for all of the cheesesteak ingredients. Sounds good, right? Oh, it so is. 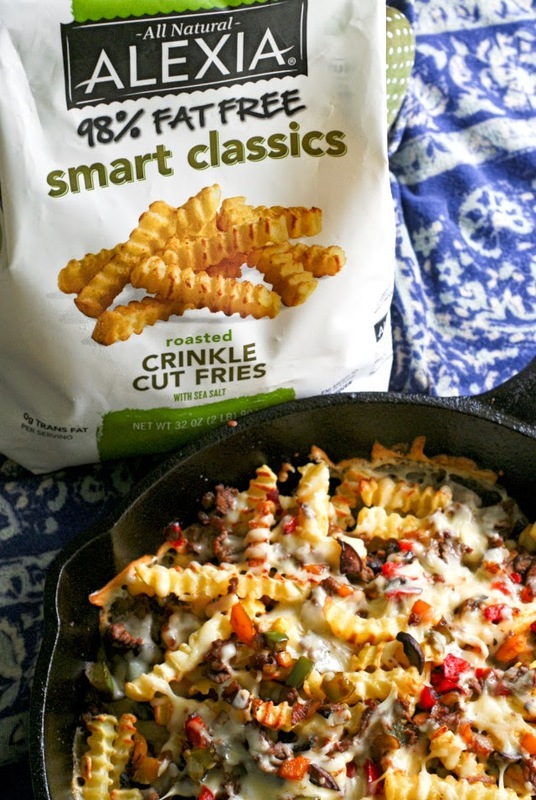 The Crinkle Cut fries are 98% fat-free, 100 calories per serving, 0 grams trans fat and start with fresh, U.S. grown Yukon select potatoes and all-natural sea salt. I love 'em and they've been a part of dinner time in our house for years! We absolutely love the Waffle Fries, too. The distinctive seasoning on them is outstanding. As for the cheesesteak filling, I slice the meat super duper thin (see notes for slicing tips), and I add lots and lots of fresh vegetables. Crisp bell peppers, sweet onions, and earthy mushrooms round out the steak and cheese loaded fries. Protein? Check. Carbs? Check. Veggies? Check! 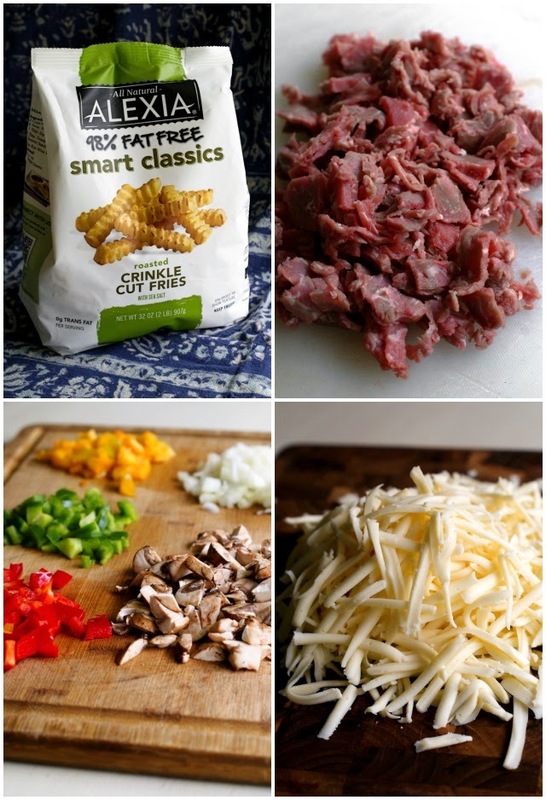 All the good stuff is in there and these loaded fries are such a fun way to transform a weeknight dinner into something extra special in less than 30 minutes. Win! This skillet meal serves 4-6 as a main dish, but if you're looking to serve more than four as a main dish, I suggest a nice garden salad on the side. This could easily be served as a finger food appetizer for a party, too. I'm thinking it would disappear at a game day get-together. I also think these would be yummy with a little dip on the side. I think I might try a jalapeno ranch or maybe something chipotle. That would be fab! If you love cheesesteaks like I do, then you should totally try this twist on the northeastern favorite. All the cheesy, melty, steak sandwich goodness on the (always delish) Alexia fries. I hope you love this creatively crafted meal as much as we did! Preheat your oven to 450 degrees. Arrange frozen potatoes in a single layer on a baking sheet. Bake for 22 minutes, stirring halfway through cook time. Meanwhile, heat the oil in a large cast iron skillet over medium-high heat. Add the mushrooms, onions, and bell peppers to the hot oil and season with salt and pepper. Cook for 5 minutes, stirring occasionally. 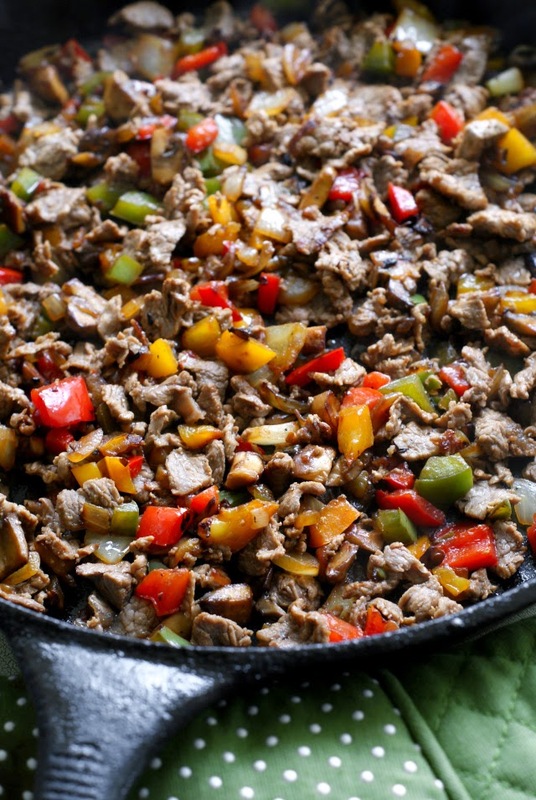 Remove the veggies to a bowl and add another tbsp of oil to the skillet. Add the steak to the skillet and season with salt and pepper. Cook for 3-4 minutes, or until the steak is no longer pink. It will cook quickly is you have it sliced extra thin, as suggested. Transfer the steak to a bowl. Remove the fries from the oven and lower the oven temperature to 350 degrees. Place half of the fries into the cast iron skillet used to cook the meat and vegetables. 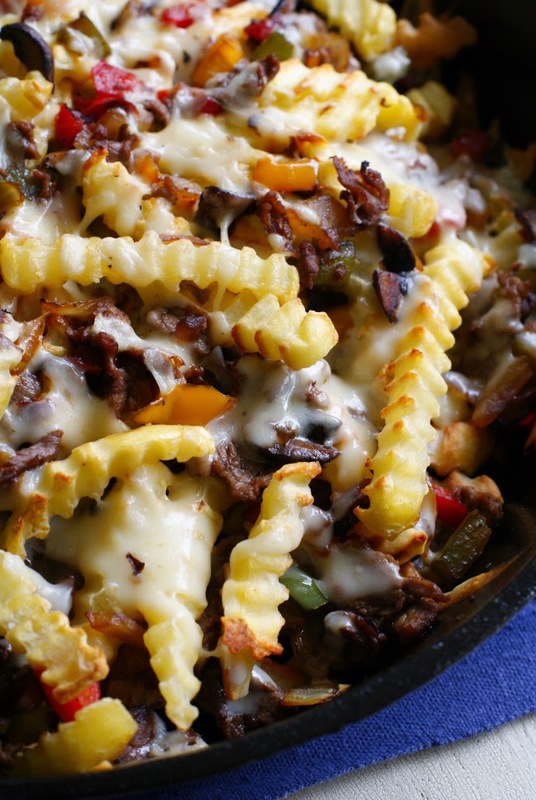 Top the fries with half of the steak, vegetables, and shredded cheese. Repeat with the remaining fries, steak, veggies, and cheese. Place the skillet into the oven and bake for 7-10 minutes. Serve immediately. When slicing the steak, a great tip for slicing extra thin (which is how you want it! ), freeze the steak for an hour before slicing and use your sharpest knife. Alexia Foods offers frozen potatoes, appetizers, breads and side dishes with minimal, but distinctive, real ingredients that serve-up exceptional taste. Alexia frozen sides are a delicious addition to a balanced meal with that little something extra and can be ready in 25 minutes—or less. This is a sponsored conversation written by me on behalf of Alexia Foods. The opinions and text are, as always, all mine.